Comfortable, well-fitting down vest in classic Fjällräven style. Made from durable wind and water resistant G-1000 Lite and lightly padded with 500 cuins down in stitched-through channels. Lined with pliant Pertex® Quantum-polyamid. 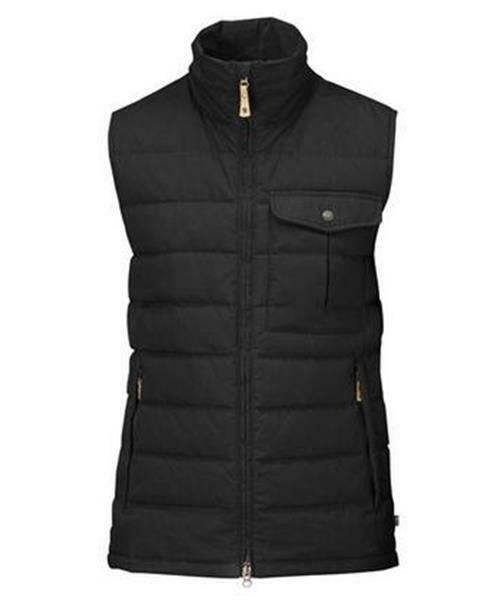 The two-way zipper can be opened from the bottom for ventilation and a flap on the inside protects against cold winds. A buttoned chest pocket and two zippered hand pockets, whose linings function as open inside pockets. A timeless, durable garment that provides extra warmth during chilly autumn walks or on the way to and from work.